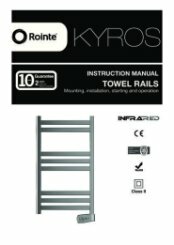 Rointe Kyros uses 1.5mm thick steel for the frame and are elegantly designed with the aesthetic of the modern bathroom in mind. 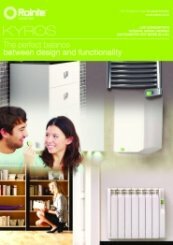 One of the widest models on the market, it provides powerful heating and plenty of storage for multiple towels. 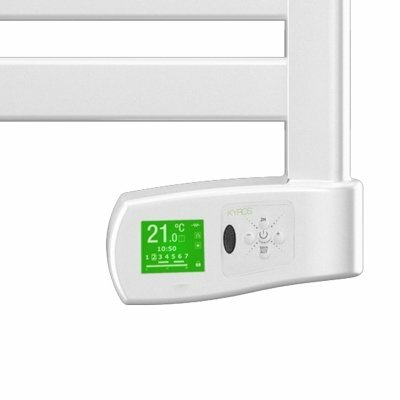 The touch control panel is colour adjustable and displays an accurate thermostat reading of the room temperature. This can be manually adjusted or set to automatically regulate itself. The installation process is quick and easy, a plug in and go system with instructional manuals and all fixings provided for. The installation template ensures a simple solution and installed successfully, it is highly splash-proof and suitable for placement in bathrooms and wet rooms. 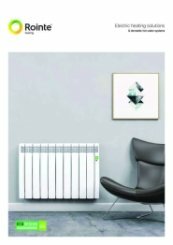 There is a range of energy saving features built in including open window detection which involves intuitive sensors detecting rapid drops in temperature and pausing output to prevent energy wastage. 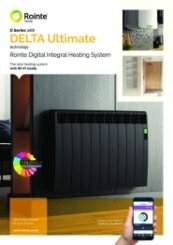 It automatically resets once the ambient temperature has stabilised, then works towards gradually rising room back up to its desired setting. This an economical and cost-effective technology which improves its efficiency and overall performance. The Rointe Kyros has an inbuilt consumption regulator which indicates usage clearly on the TFT display. The status can be easily checked through the Effective Power function, it displays the nominal power compared to the effective power during periods of operation. 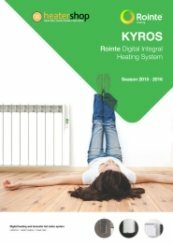 With ECO modes and temperature limiters, the efficiency of the Rionte Kyros is first class. Choose from a selection of preinstalled programmes or customise your own for ultimate comfort. 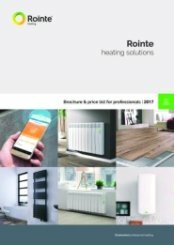 The Rionte offers full control over your bathroom’s heating; the infrared remote control features multiple keys providing easy access to four customisable presets. It offers a lock function which prevents changes being made, perfect for nursing homes, hotels and childcare facilities. The Kyros boost mode maximises heat radiation for a short time: 15, 30, 60 or 120 minutes. The boost mode temporarily overrides other set modes and provides powerful warmth exactly when you need it. The 24-hour 7-day timers are fully programmable, ideal for those with irregular schedules. The manual included explains how to maximise the functionality of the Kyros. 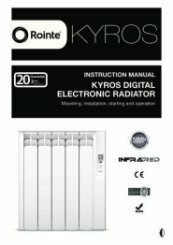 A quiet unit and Lot 20 compliant, the Rointe Kyros is an excellent solution, simple to setup and cost-effective.